Mali Mish – Day 114: Heat wave in the west. 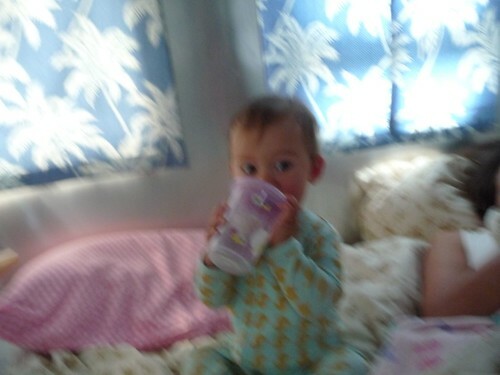 Why is this picture blurry you ask? Well, do you ever drive down a two-lane asphalt road on a hot day and see that distorted mirage down in the distance in front of you right above the road? This is just like that. It is so hot here now we are getting the heat shimmers inside Mali Mish. OK, not really, but you get the idea. We decided to start heading down towards the I-40 and begin to head our way back to California. 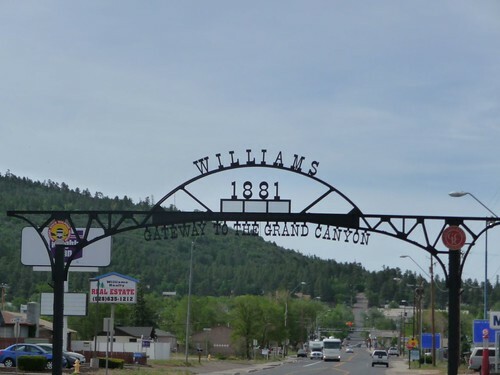 Right as the road from Grand Canyon meets the I-40 is a little town called Williams, Arizona, also known as Gateway to the Grand Canyon. We stopped briefly there to get a quick breakfast before heading west. We looked at several places to spend a few nights along the Interstate so we wouldn’t have to go home just yet. 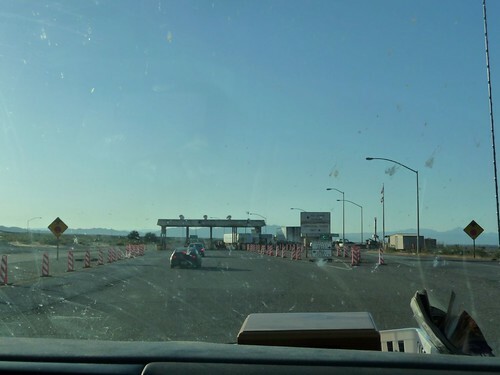 Small towns in Arizona like Kingman, Arizona or Barstow, California on the other side of the border were both options that we contemplated on staying at to check out some local attractions for a few days. But that plan was quickly abandoned when we saw the weather report and it showed heat warnings all along the way with temperatures exceeding 115 degrees in most places. We don’t have much of a choice at this point. Looks like we are headed straight home. Once we got back on the I-40, we were driving along the historic Route 66 once again just as we were in Oklahoma, Texas and New Mexico. 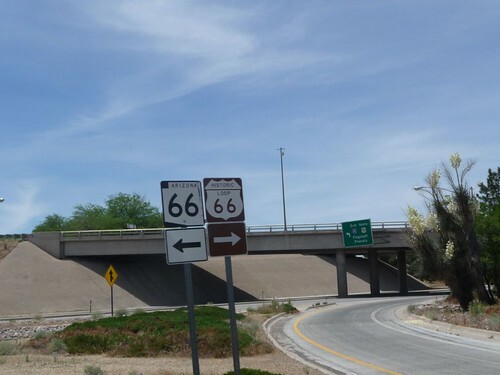 Arizona has several interesting stops that still have vintage Route 66 memorabilia. Our priority now though is to figure out where we can take a break with the kids without cooking in the sun. 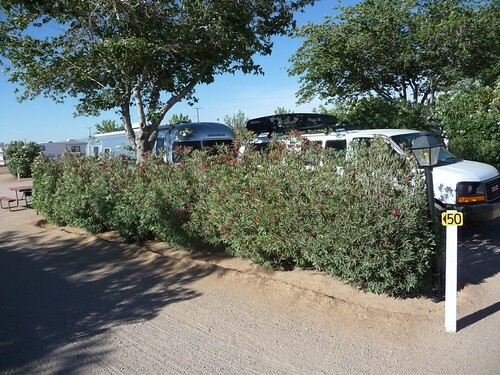 One of the ideas we had was to find a campground with hookups and just pay for the night so we can connect to their electricity for air conditioning. Even if we decide to not stay the night, we can at least get a long enough break for the mid day heat to break before heading back out. 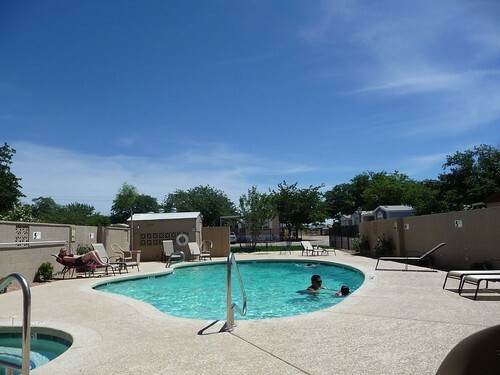 Marlene looked at our options and decided to call the KOA in Kingman, AZ. The campground operator actually agreed to let us pay a partial fee to just stay for the afternoon. They have never done that for anyone before but I think they realize this intense heat is a good enough reason to make a small exception for us. We met a few HVAC technicians San Diego that were called in due to the heat wave, apparently they are much needed. in these parts. We pulled in and got all hooked up in one of their sites for just $20. 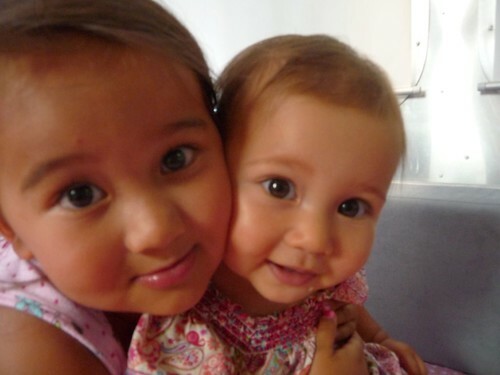 The girls were happy to get out of their car seats for a well deserved break. We made some sandwiches and Ava got to watch a little cartoon via their cable TV hookup. Our $20 even got us entry into their swimming pool for us to cool down and feel like we are still on vacation for just this one last time. 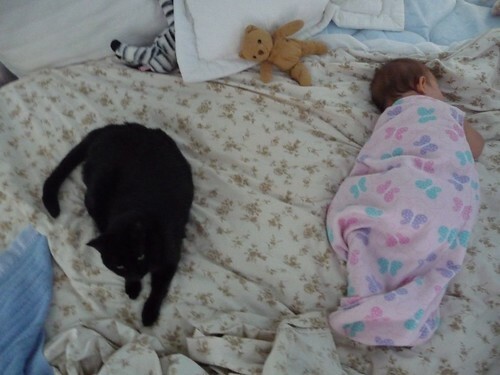 Back in the mish, Mila got to nap in the bed instead of inside the van while driving down the road. Ava is usually full of energy and bouncing off of the walls but the heat has zapped her right into a TV watching zombie. As the sun slowly crawls across the western sky, we got back on the road to finish the rest of the journey back towards California. 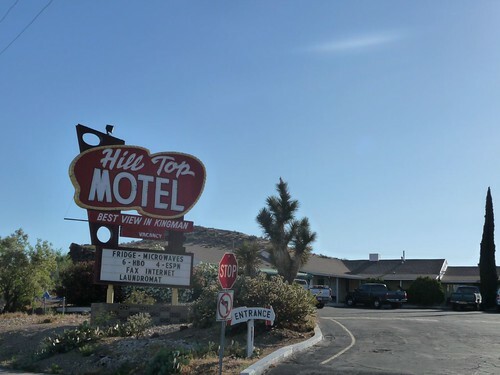 Before leaving Kingman, we got to drive by and check out the once popular Route 66 Hill Top Motel with its newly restored sign. 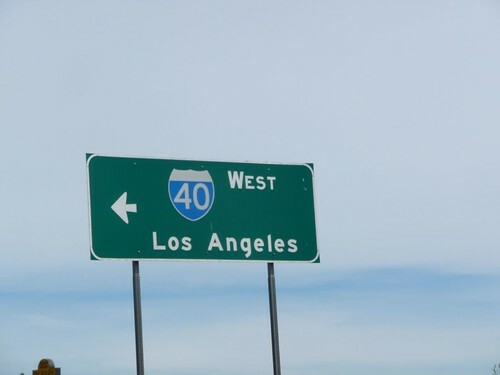 And for those of you from the California, this is a sign that home is definitely near. 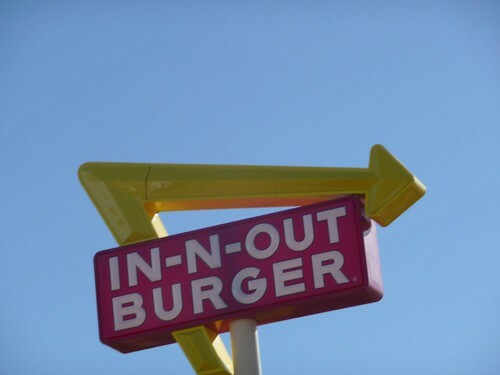 I have not seen an In-N-Out burger since we flew back home for Easter back in April. 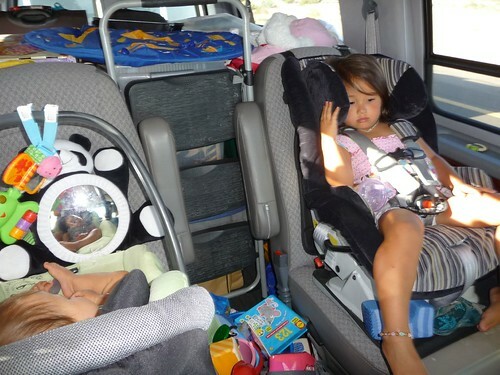 Here is what Ava’s view looked like for the last 4-months as we drove across country. And this is what Marlene’s view looked like when she turns around to check on the girls. Look at all that gear behind their seats! 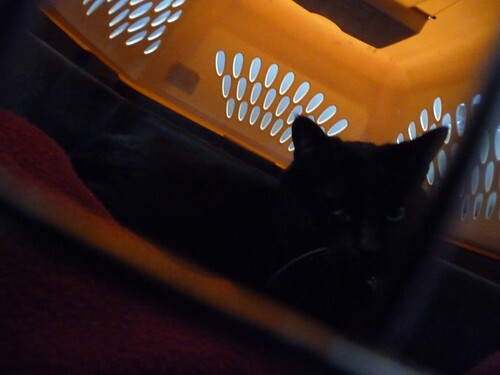 And of course, Yoda and her cushy little pet carrier is where she spent her time while on the road. As we crossed back to California, we came across something we have not seen while crossing any other state line. An agricultural check point. 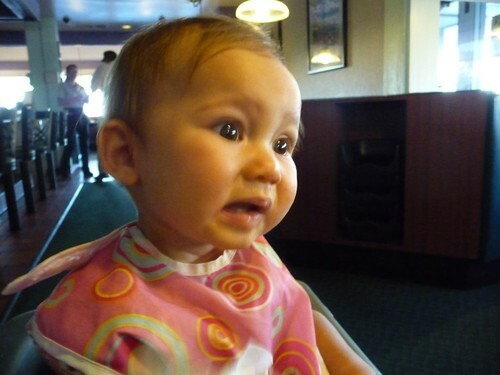 For some reason, California really doesn’t want fruits and vegetables to come into the state. Or maybe it is a front for an immigration check point. 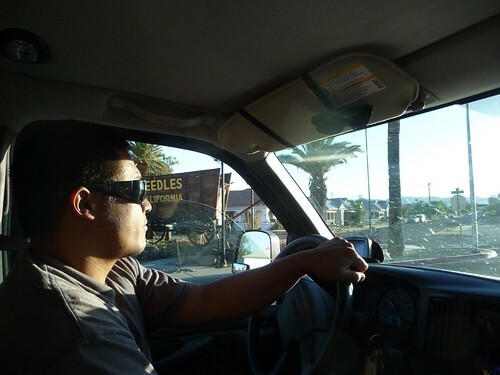 Our last stop before sunset is at a little town called Needles, CA. There we took another break for dinner before completing the last leg of our trip. Welcome back to California Mila! By now, you have spent more of your life on the road than at home.